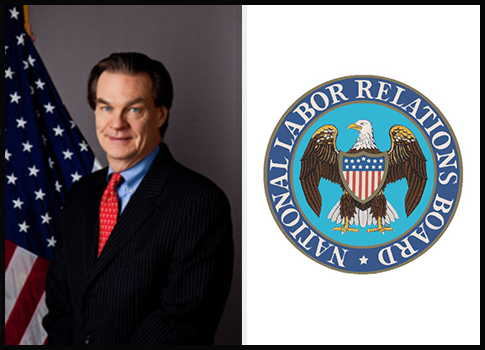 A recent lawsuit filed in a federal court in California alleges that National Labor Relations Board (NLRB) member Richard Griffin was complicit in a scheme to cover up embezzlement at a major labor union by terminating employees who attempted to expose the effort. The allegations appear in a lengthy complaint filed against the International Union of Operating Engineers (IUOE). The lawsuit alleges numerous violations of the Racketeer Influenced and Corrupt Organizations (RICO) Act, and names Griffin, IUOE’s former general counsel, as a defendant. President Barack Obama controversially appointed Griffin to the NLRB in January 2012 in a move some observers described as illegal. He never faced confirmation hearings or standard background checks. According to the lawsuit filed by 10 members of Los Angeles-based IUOE Local 501, which represents workers in Southern California and Southern Nevada, Griffin participated in a conspiracy to manipulate the operation of Local 501 "through a pattern of racketeering activity." Griffin was served with the complaint and a court summons relating to the lawsuit at his Washington, D.C., home on Dec. 4, according to documents filed in court. The complaint states that in 2009, James McLaughlin, then the business manager of Local 501, began investigating suspicious expenditures by Dennis Lundy, a Local 501 member who was in charge of the union’s apprenticeship fund. McLaughlin suspected Lundy was embezzling money from the fund. McLaughlin demanded that Lundy repay about $4,000 to the fund after an independent audit, which Lundy refused to do. The investigation caught the attention of IUOE’s general president, Vince Giblin, reportedly a friend of Lundy’s. Giblin demanded that McLaughlin drop the investigation. The latter refused. According to the lawsuit, Giblin would later tell another Local 501 official, "I told [McLaughlin] to make that Lundy thing disappear and he never did. That lazy fat f*** has got to go!" Giblin threatened to place Local 501 into the trusteeship of the IUOE unless McLaughlin two other Local 501 officials assisting the Lundy investigation resigned. Griffin served as Giblin’s point man during much of the back-and-forth with McLaughlin, according to the complaint, earning him a spot on the lawsuit’s list of defendants. The court filing repeatedly refers to IUOE’s demands as coming directly from Griffin and cites "threats, communicated from Giblin through" Griffin. He communicated to McLaughlin’s legal counsel that in order for IUOE to "leave Local 501 alone," McLaughlin would not only have to resign, but also fire Finn Pette, his protégé and partner in the Lundy investigation. When McLaughlin refused, Griffin reportedly targeted a third Local 501 member involved in the investigation. McLaughlin later attempted to negotiate a successor as Local 501’s business manager to take over upon his retirement. Griffin personally communicated that two of his preferred successors were "unacceptable," as McLaughlin’s counsel put it. The lawsuit cites these events in its claim that the defendants, including Griffin, "each personally plotted, conspired, and agreed" to attempt to direct the affairs of Local 501 "through a pattern of racketeering activity." The lawsuit seeks $7.5 million in damages for a host of RICO violations as well as for violations of the Labor Management and Disclosure Act and charges of aiding and abetting. An NLRB spokesperson referred questions to Griffin’s attorney, Frederic Woocher, of the Los Angeles litigation firm Strumwasser & Woocher LLP. Woocher called the allegations "preposterous" and said the "frivolous lawsuit" was brought by "a couple of folks who were unhappy with their position in the union." The IUOE did not respond to requests for comment. Griffin’s alleged involvement with some of IUOE’s criminal elements has drawn scrutiny from top lawmakers. Sen. Orrin Hatch (R., Utah), a member of the Senate Committee on Health, Education, Labor, and Pensions, sent a letter to Griffin in July asking about ties to members of union locals convicted of various crimes during his time at the IUOE. Hatch also asked for a "detailed list" of all issues on which Griffin had worked pertaining to "fraud, embezzlement, or other financial misconduct" by officials at IUOE or its locals. Griffin’s response did not mention specific instances of wrongdoing at the International. He told Hatch that he "promoted a culture and practice of the highest ethical standards, and strengthened the internal mechanisms for dealing with criminal conduct" during his time at the union. The letter also failed to mention Local 501. This entry was posted in Politics and tagged Barack Obama, Congress, Obama Administration, Orrin Hatch, Richard Griffin, Unions. Bookmark the permalink.